Project Eternity backers will get to choose between a Steam or Good Old Games key upon release. When one considers how the distribution deals are made between game publishers and retailers, the image that comes to mind is one of corporate executives wearing fine suits, crowded together in a stuffy boardroom. But with the new frontier of self-published, crowd-funded games, how will such deals be made? Project Eternity developer Obsidian Entertainment and affable online retailer Good Old Games seem to have the answer: On Twitter, of course! With a single wordless tweet, the deal was proposed. 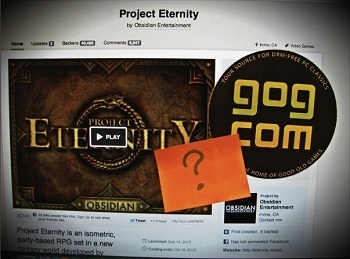 The question was posed with a photo, the Project Eternity Kickstarter page with a Good Old Games sticker atop it, and a single question mark hanging between. Obsidian promptly replied in kind, replacing the inquisitive punctuation with an affirmative exclamation point. And so the deal was sealed, and confirmed by the most recent update to the game's Kickstarter page: Project Eternity is coming to Good Old Games, completely DRM free. When the game is released, all of Eternity's Kickstarter backers will have the choice of receiving a Steam key or a Good Old Games key. It may very well be that there was more going on behind the scenes, some contract negotiations that were finalized long before this public display. In that case, this would merely be a publicity stunt or - at best - a creative way of announcing it. But there is something almost enchanting about the idea of a strange new world where there are no publishers, games are crowd-funded, and corporate deals are made via Twitter, isn't there?